Dennis Lutteke, a kind-hearted Minnesotan and grandfather, isn’t who you’d expect to see atop a chariot of fire, ravaging his farm’s weeds with the pyrotechnic power ordinarily found at a Pink Floyd concert. But there he sits, unleashing flames with an easy smile. And for good reason. Lutteke grew up on the family farm, working in the long shadows of his dad and grandpa. When he struck out on his own in 1978, he and his wife decided to farm without fertilizers or pesticides. The decision to go organic tested their farming mettle. At first, weeds like lamb’s quarter and Canada thistle — emerging after years of pesticide repression — roared back and crowded Lutteke’s crops and forage pastures. Something had to be done. So a few years later, when a friend brought some rusty, dirty flamer equipment up from Mississippi, Lutteke had a possible fix for weed control. 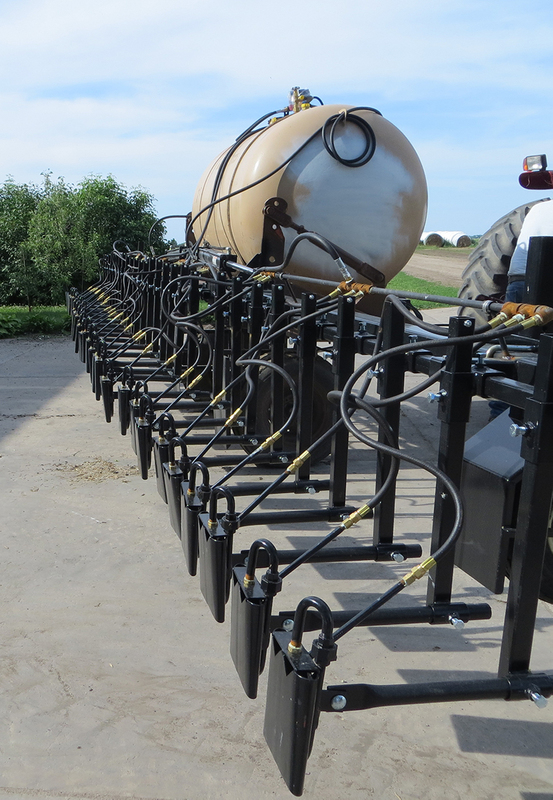 After plenty of mistakes and prototypes that fell flat in the field, Lutteke developed a working model to hitch to his cultivator. And in 1986, after using flame weeding on his farm, he sold one to a nearby farmer friend. Now, with the help of his son and grandchildren, Lutteke builds between 1,000 and 1,500 flamers each year, lighting up the skies from Canada to Texas and California. Photo by Lutteke Organic, Inc.
Lutteke talks about each farmer as if they’re an old friend. He helped an Amish farmer in Kentucky figure out how to pull a torch behind draft horses and mules. 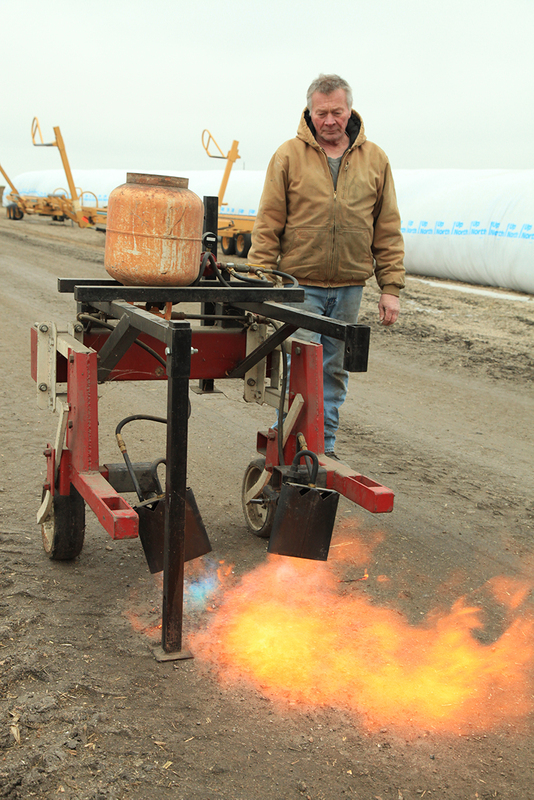 From 40-inch garden bed farmers to 80-foot-wide walls of fire for commodity crops, Lutteke builds what people want. And if they don’t like it, he’ll take it back. So far, he’s had no returns. He continues to operate the family’s dairy farm, part of the Organic Valley cooperative, while his kids and grandkids build flamers, paying for college with the modest profits. With no email and no cellphone, Lutteke’s patrons are all word-of-mouth. He hopes to host a field day this year to showcase his flame-weeding tools — the last one attracted 275 people — and give farmers another, nonpesticide option in their toolkit. A vision of clean farming and how to help others do the same drives Lutteke to keep up with his unplanned side business. 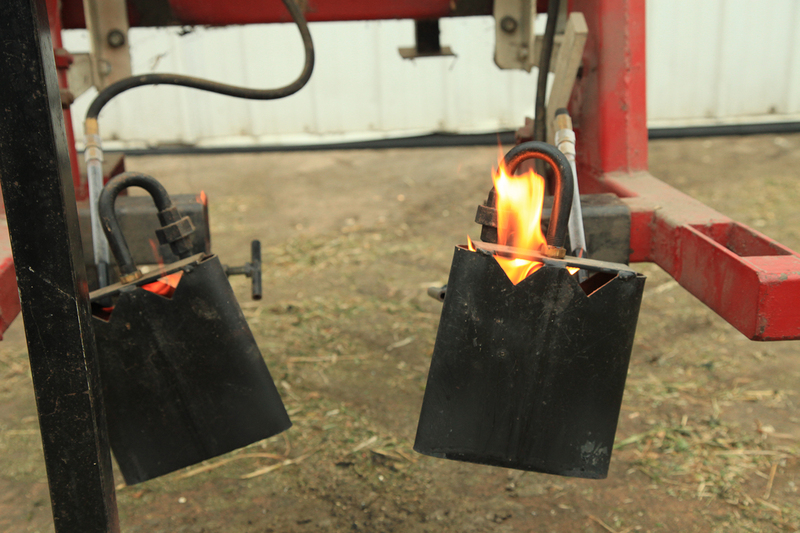 One farmer in Canada called Lutteke at the end of the last growing season to tell him that with the cost savings from his flamer, he wouldn’t have to sell the farm business. Chris Roddy is currently Oregon Tilth's Communications Director. He has worked with several national nonprofits such as Local Initiatives Support Corporation and ExpandED Schools, as well as with leading digital advertising firm, Agency.com (Designory).